Q, T, Y, Z—for RNAV routes that do not form part of the regional networks of ATS routes. S—to indicate a route established exclusively for use by supersonic aircraft during acceleration/ deceleration and while in supersonic flight. Z—for RNP 1 routes at and below FL 190 to indicate that all turns on the route between 30° and 90° should be made within the tolerance of a tangential arc between the straight leg segments defined with a radius of 15 NM. Note: RNAV Q-routes require en route RNAV 2, corresponding NAV/E2 code and PBN/C1-C4 based on navigation system update source. Where suffixes F, G, Y or Z specified in above, are used, the flight crew should not be required to use them in voice communications. Below is an example of how the letters and numbers are spoken. The en route chart excerpt depicts three published RNAV jet routes: J804R, J888R, and J996R. [Figure 2-45] The R suffix is a supplementary route designator denoting an RNAV route. The overlapping symbols for the AMOTT intersection and waypoint indicate that AMOTT can be identified by conventional navigation or by latitude and longitude coordinates. Although coordinates were originally included for aircraft equipped with an inertial navigation system (INS), they are now a good way to cross check between the coordinates on the chart and in the flight management system (FMS) or global positioning system (GPS) databases to ensure you are tracking on your intended en route course. The AMOTT RNAV waypoint includes bearing and distance from the Anchorage VORTAC. Random RNAV routes are direct routes that are based on RNAV capability between waypoints defined in terms of latitude or longitude coordinates, degree-distance fixes, or offsets from established routes or airways at a specified distance and direction. Radar monitoring by ATC is required on all random RNAV routes. 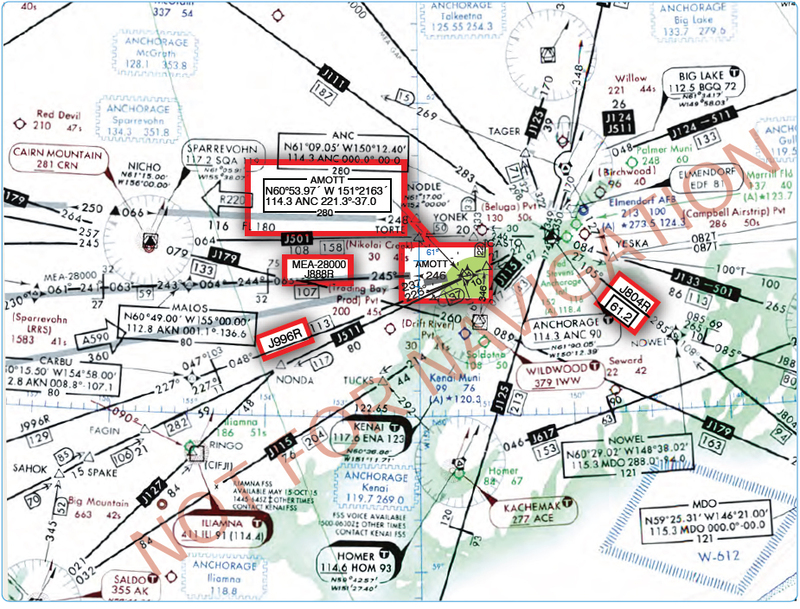 Random RNAV routes can only be approved in a radar environment. Factors that are considered by ATC when approving random RNAV routes include the capability to provide radar monitoring and compatibility with traffic volume and flow. ATC radar monitor each flight; however, navigation on the random RNAV route is the responsibility of the pilot. Plan the random route portion of the flight plan to begin and end over appropriate arrival and departure transition fixes or appropriate NAVAIDs for the altitude stratum within which the flight is conducted. The use of normal preferred DPs and STAR, where established, is recommended. Define the random route by waypoints. File route description waypoints by using degree distance fixes based on navigational aids that are appropriate for the altitude stratum. File a minimum of one route description waypoint for each ARTCC through whose area the random route is flown. These waypoints must be located within 200 NM of the preceding center’s boundary. Plan additional route description waypoints as required to ensure accurate navigation via the filed route of flight. Navigation is the pilot’s responsibility unless ATC assistance is requested. Note: To be approved for use in the NAS, RNAV equipment must meet the appropriate system availability, accuracy, and airworthiness standards. For additional guidance on equipment requirements, see Advisory Circular (AC) 20-138C, Airworthiness Approval of Positioning and Navigation Systems. For airborne navigation database, see AC 90-105, Approval Guidance for RNP Operations and Barometric Vertical Navigation in the U.S. National Airspace System. File airport-to-airport flight plans prior to departure. Plan the random route portion of the flight to begin and end over published departure/arrival transition fixes or appropriate NAVAIDs for airports without published transition procedures. The use of preferred departure and arrival routes, such as DP and STAR where established, is recommended. Define the route of flight after the departure fix, including each intermediate fix (turnpoint) and the arrival fix for the destination airport in terms of latitude/longitude coordinates plotted to the nearest minute or in terms of Navigation Reference System (NRS) waypoints. For latitude/longitude filing, the arrival fix must be identified by both the latitude/ longitude coordinates and a fix identifier as shown in the example below. Fly all routes/route segments on Great Circle tracks. Make any in-flight requests for random RNAV clearances or route amendments to an en route ATC facility.